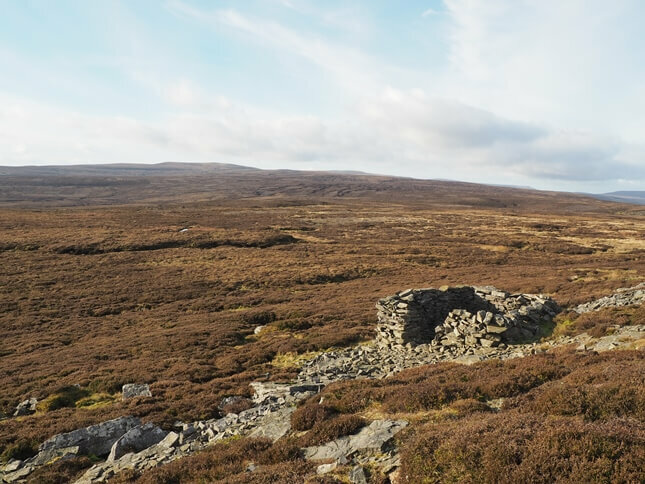 Oxnop Common is a moorland summit to the west of the Askrigg – Muker road on the watershed between Wensleydale and Swaledale. 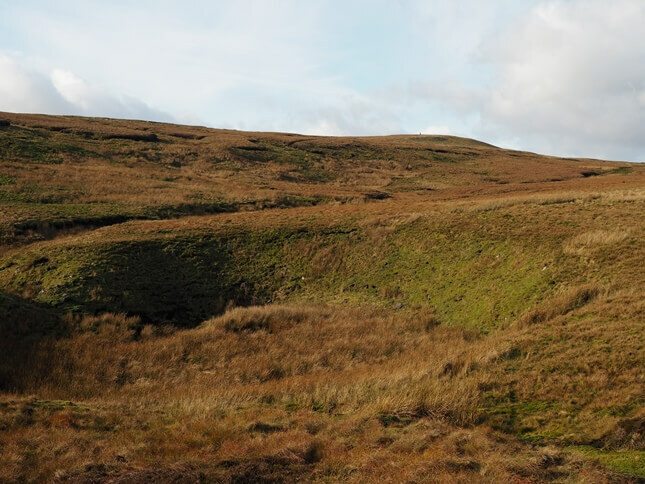 The fell is named after the scattered community of Oxnop which includes the farms at Low Oxnop and High Oxnop. The latter is found in the side valley of Oxnop Beck. This valley culminates at its head with magnificent limestone cliffs of Oxnop Scar. 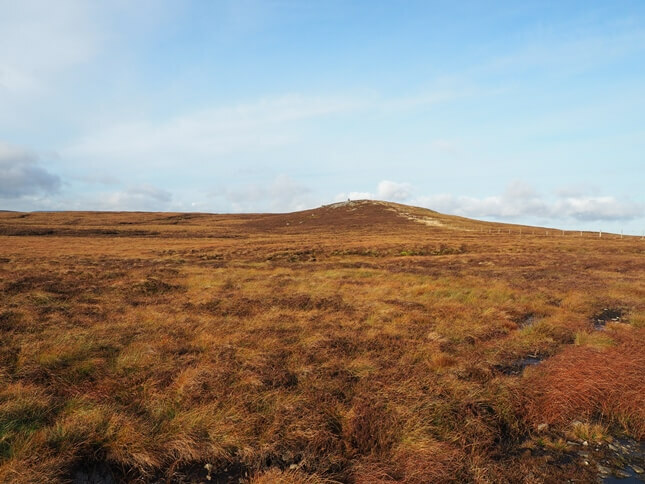 The summit of Oxnop Common is a small but noticeable ridge which is called Blackstone or Blackstone Edge on the Ordnance Survey Explorer map. There is no real ‘edge’ as such but there is a scattering of gritstone, especially immediately to the west of the highest point. The highest point is marked by a large cairn which is situated next to a fence. 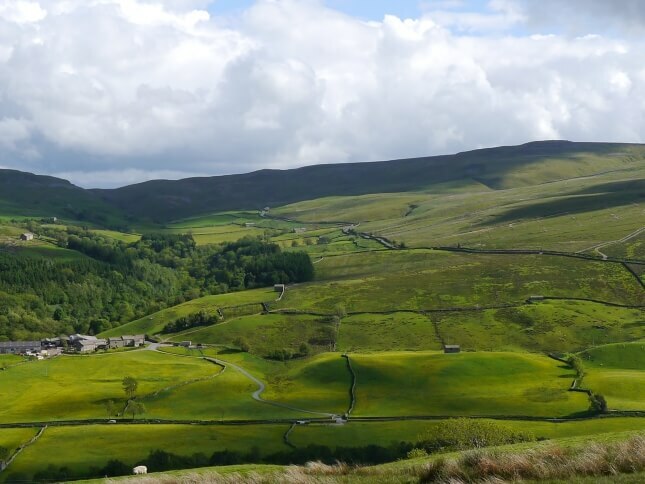 The view is really quite extensive and includes many of the high fells of the Dales. To the south Buckden Pike and Great Whernside are well seen. North is Rogan’s Seat while to the west a few miles of very rough moorland leads to Lovely Seat. 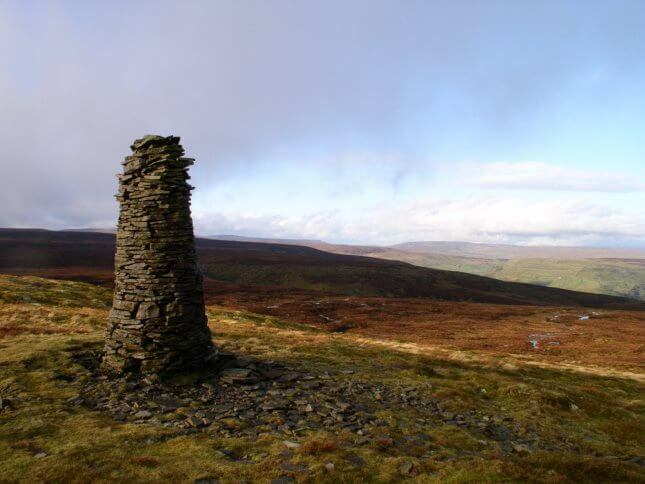 A few minutes walk to the north is an even taller cairn labelled as a beacon on the map. This magnificent specimen is about 10ft high and commands a great view over Kisdon and the small section of Swaledale above Muker. Other features of interest in the summit area are a solid square built shelter just below the highest point. A couple more shelters can be found on the slopes either side of the beacon. One lies out of sight of the beacon immediately to the east and has seating room strictly for one only! As with most summits on the Ure / Swale watershed it is not particularly well seen from the valley. One tends to have to be on one of the neighbouring tops to the east or west to spot it. Similarly elevated positions to the south or north also being the summit area into view. There is one very simple route to the summit of Oxnop Common. 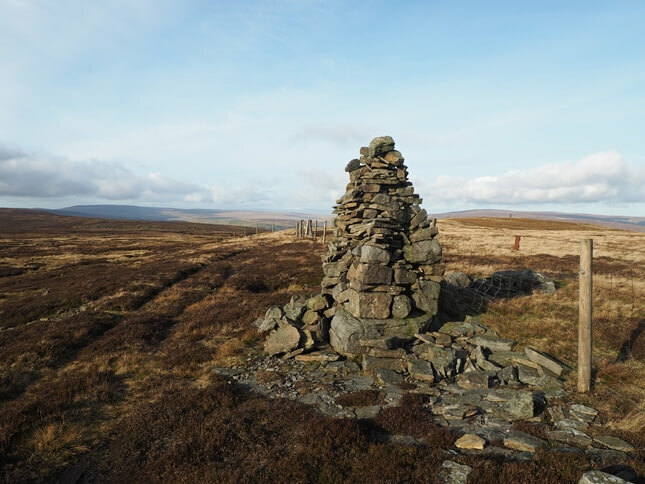 This starts from the small parking area on Askrigg Common on the Askrigg to Muker road. From the parking area a solid track, a bridleway, heads away west across Askrigg Common. Turning into a pleasant green path it then swings north. Becoming moister in its upper reaches the path eventually meets a fence just above which is the summit. There and back again on the same route the total distance is just under five miles. 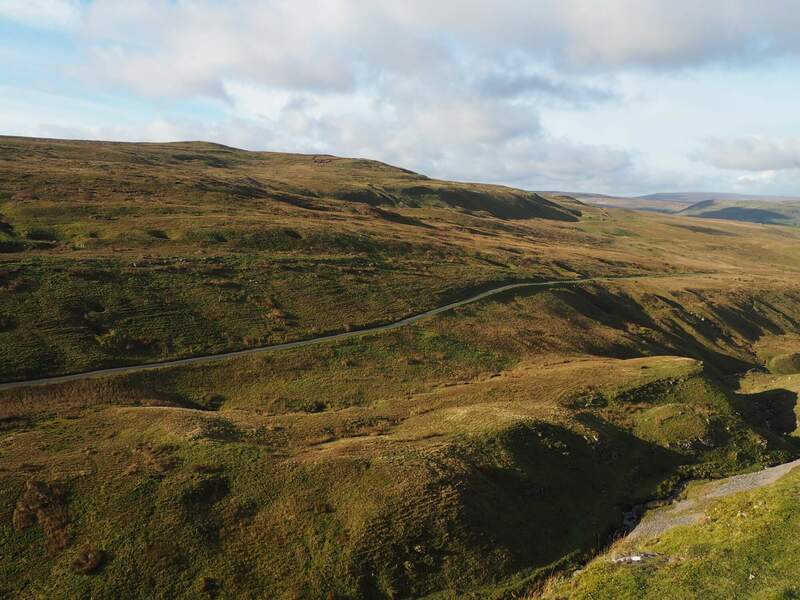 Other options include a rough pathless climb from the road at the top of Oxnop Gill. This involves crossing lots of boggy channels. Lealamb Pot may be encountered on the way up. I went in search of it on my third visit and found it to be much less dramatic than it appeared on the map. Another option I’ve tried is via the bridleway from Helm to Coghill Closes. 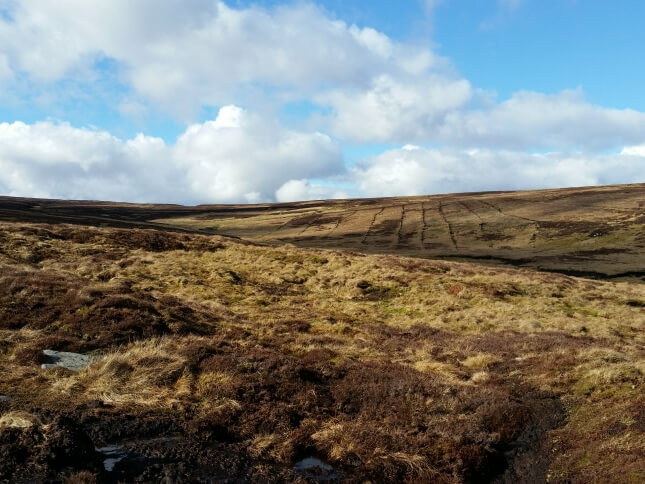 Above the latter I turned north-east to cross Whity Gill and climb up to the bridleway on Askrigg Common. It is not a route I’d strongly recommend as the going was tough in places. 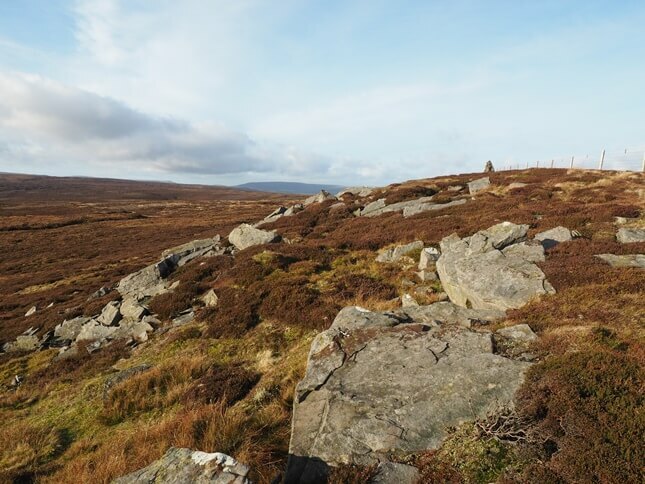 Its main appeal is that allows one to create a circular walk from Askrigg. 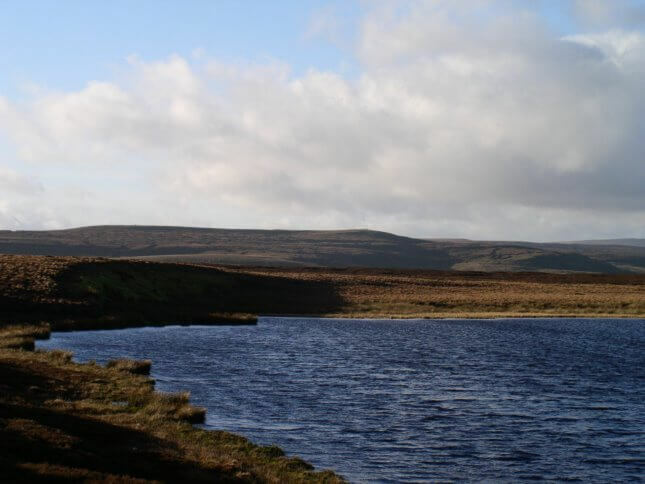 My first experience of Oxnop Common was in 2007 when my friend and I walked up from Askrigg. The weather was awful, strong winds, rain and low cloud. Suddenly, when we were within minutes of the summit, the cloud began to lift. Then, as we walked north to the beacon the sun came out. Going from visibility of virtually nil to wonderful views of Swaledale in the space of a few minutes was quite magical. For this memory alone Oxnop Common will always have a special place in my heart.